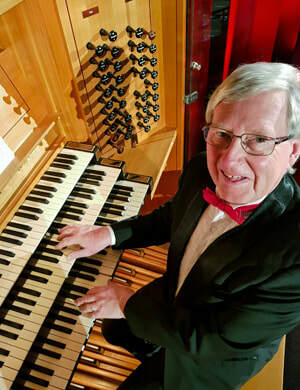 …combining academic depth with dynamic flair and a rare and happy knack in selecting music that entertains as well as edifies"
​Christchurch's Town Hall organist Martin Setchell is an international concert organist who believes in promoting entertaining music to a wide audience. Born and educated in England where he was awarded a Fellowship of the Royal College of Organists, he studied at various times with Pierre Cochereau, Marie-Claire Alain, Piet Kee, and Peter Hurford. He emigrated to New Zealand in 1974 on his appointment to the University of Canterbury School of Music where he taught for 40 years and became Associate Professor of Music. In 2014 he resigned his University position in order to devote himself full time to his work as a professional freelance musician, performing, writing, speaking, editing and teaching. Since 1997, when he was appointed curator of the Rieger pipe organ by the City Council, he has devoted himself to promoting the organ as a concert instrument internationally. In 2008 he was honoured by the city for his services to music and the Town Hall organ in particular. His solo concert tours outside New Zealand regularly take him to Australia, America, Europe and the Far East. This year (2019) his concert tours include Australia, Germany, and the Bergen Festival Norway as well as throughout New Zealand. As a composer, Martin Setchell concentrates on writing tuneful and accessible organ and choral music. His humorous Wedding March extraordinaire is recently published by Butz MusikVerlag in Bonn. He is also known for his volumes of transcriptions for organ. Music by Fauré and Bizet and the Sousa marches are published by Kevin Mayhew Music and his arrangements of Saint-Saens, Purcell and Bach are published by OUP in their Oxford Organ Series.